Democrats have a real chance to win back power in the upcoming midterms and 2020 elections, but what would the Democratic base expect that their newly elected representatives do with that power? We fielded and analyzed a nationally representative survey of 1,903 Democrats, who we each gave 100 “points” of political capital to allocate between 15 federal policy proposals (a forthcoming blog will explore state-level priorities). Since each respondent was given a limited number of points, they are forced to make tradeoffs based on their priorities if they favor multiple policies. That way we can determine what the base is most enthusiastic about, even if every policy is popular when polled individually. We can quickly summarize the results by averaging the percentage of points allocated to each policy by all respondents, shown below. Medicare for all received the most points on average out of any other policy with 15 percent. When combined with cheap prescriptions, over 20 percent of points were allocated to healthcare related policies. Democrats have made healthcare a top campaign issue, and given the popularity of Medicare for All and policies that reduce the cost of prescription drugs, it’s not surprising to see that healthcare is a top priority for the base. Following Medicare for All, gun control, impeaching Trump, and immigration reform each got similar levels of support (13 percent, 12 percent, and 11 percent respectively). After these top five policies, support begins to fall off, with green jobs recieving 9 percent of points and pay equity receiving 7 percent. While it’s useful to view the results in aggregate, we have to account for the fact that different groups and individuals could vary substantially in both their policy preferences and the intensity of their priorities. 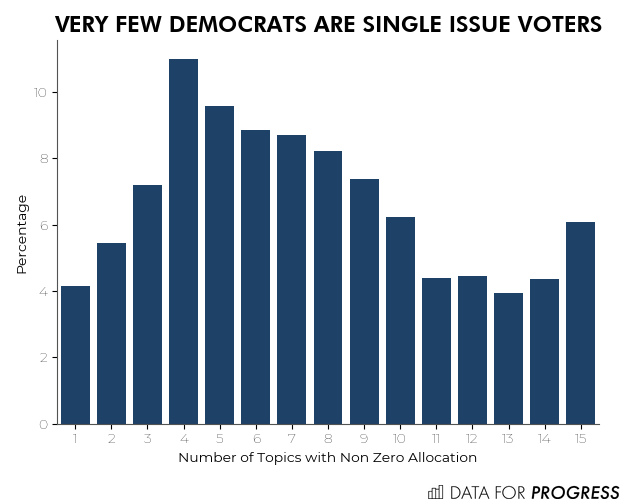 It appears that there are very few single issue Democrats, which we can see by plotting the distribution of the number of policies that each respondent gave at least one point to. About four percent of Democrats allocated all of their points to a single policy, while about six percent allocated at least one point to every policy. The modal number of policies that got at least one point was four. Even if someone allocates points to three or four policies, there are a number of ways those points could be divided up. Plotting the distribution of the maximum amount each respondent allocated to a single policy gives us some additional information about how respondents allocate their points. That distribution peaks strongly at about 25 points, and the overwhelming majority of Democrats spread their points over several policies. While most Democrats care about several issues, it’s worth digging in to see which policies are supported by the single issue voters. Below we compare the distribution of point allocation among all Democrats vs only those Democrats who allocated at least 80 points to a single policy. Nearly 50 percent of points allocated by the single issue group went to impeachment, an enormous gain relative to all Democrats. While impeachment draws some of the most intense support, albeit from a relatively smaller portion of the base, we’d also like to know which policies are broadly popular. Below, we show the distribution of point allocation by amount for each policy. Note, each of these distributions has a large point mass at zero which we do not show, although the remainder of the distribution is rescaled to account for this. Of the top four policies nationally, Medicare for All, gun control, and immigration reform all have broad support (many people allocating small to moderate amounts) in addition to intense support (a significant number of people allocating most of their points). While impeachment clearly has some of the most intense support, this comes from a much smaller portion of the base and support is not very broad. We also see that several issues such as pay equity, criminal justice reform, college affordability, and regulating wall street have fairly broad support despite not faring particularly well in the national rankings. These policies tended to get support from a lot of people, but in small amounts. Since different policies present different policy and political challenges, these results have interesting implications. For example, Medicare for All will affect an enormous part of the economy and is vehemently opposed by nearly every Republican lawmaker. It would be inconceivable for a Democratic government to pass a bill like Medicare for All without both broad support from the base as well as intense support from a core group of activists. Criminal justice reform and regulation of the financial sector all got very broad support, but lacked in intense support relative to other policies. Implementing either of these is impeded by deeply entrenched special interests, which are hard to defeat without a base that matches those interests in intensity. Activist movements like Black Lives Matter have been successful in raising the salience of criminal justice reform, and given how harmful mass incarceration and unaccountable police violence is to some of the most vulnerable members of society, this should be an obvious cause for Democrats to take up. Similarly, regulating wall street would also seem like an easy position to take since practically no one thinks that the financial industry should not be regulated more strictly and lack of regulation allows fraud and market manipulation to go unpunished. An administration typically is only able to pass a few major pieces of legislation, however, and Democrats appear to be coalescing around healthcare. Being a big tent party containing many groups with varying priorities presents Democrats with a unique political challenges that the much more homogenous Republican party does not face. Democrats must ensure that they are addressing the material needs of all their constituents with a broad platform of policy ideas covering a wide range of issues.